At a press conference, the national spokesperson claimed that the organisation is being targeted. He also said that those arrested may have attended meetings, but were never members of the Sanstha. 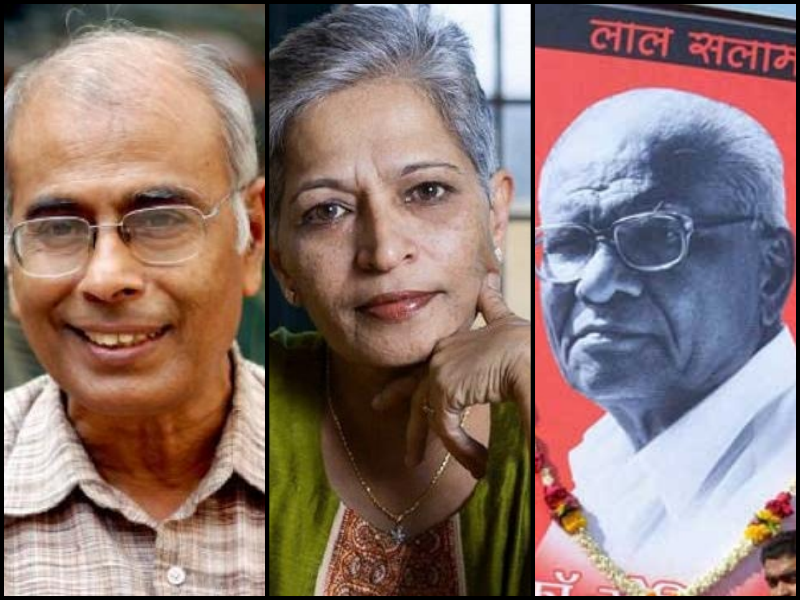 Mumbai: Controversial organisation Sanatan Sanstha has denied that any of the persons arrested in connection with the murders of rationalist Narendra Dabholkar and journalist Gauri Lankesh have anything to do with them. “None of them have ever been a part of our organisation. They must have attended our meetings and must have been staunch supporters of Hindutva, but that does not mean they have been a part of Sanathan Sanstha,” said Chetan Rajhans, the national spokesperson of the organisation at a press conference in Mumbai on Monday. The arrests were made by the Maharashtra and Karnataka Anti- Terrorism Squad (ATS) and the Central Bureau of Investigation (CBI). 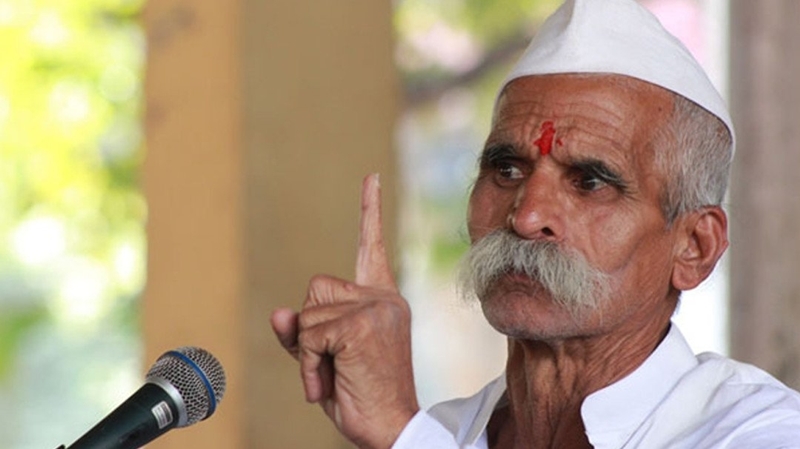 Rajhans and Sunil Ghanwat of the Hindu Janjagruti Samiti (HJS), an off- shoot of Sanathan Santha, claimed that the police have not directly implicated any of its ‘sadhaks (followers)’ in any case. “It’s a witch hunt that began soon after Panvel and Thane bomb blast incidents in 2008. But the police has not named us in a single FIR or chargesheet. There have been demands made to ban our organisation. But these demands are baseless and made with malicious intentions,” Ghanwat announced. They also reiterated their demand for an amendment to remove the word “secular” from the Preamble. Rajhans blamed the Emergency and Indira Gandhi for the inclusion of the term in 1976. “The inclusion happened under political pressure. It is time we drop the word,” Rajhans said. Sanathan Sanstha has been making this demand for a long time. Today at the press briefing, Rajhans said that the term has no clear meaning and has not even been defined in the constitution. “This ambiguity is intentionally used against Hindus,” he claimed. Sanathan Sanstha, an organisation floated 19 years ago, has been actively propagating the formation of a “Hindu Rashtra”. The organisation, with its headquarters in Ponda, Goa, has spread its reach across Maharashtra, Karnataka and Goa. The Sanstha was established by Jayant Athavale, a hypnotherapist, to promote Hinduism. HJS, which operates on an identical ideology, was formed a little later in 2002. The Sanstha claims as many as 320 Hindu outfits are connected with it, which have all been collectively working for the “Hindu cause”. The Sanstha and HJS were first named for their role in the Thane blast case of 2008 and since then they have been accused of playing a direct role in Madgaon blast, murders of Dabholkar, Lankesh, and CPI leader Govind Pansare and scholar, teacher and rationalist M.M. Kalburgi. These investigations have been carried out by different state and central agencies and common names have emerged, all pointing towards Sanathan Sanstha, according to investigators. The demands to ban the organisation were first made in 2013 by the Maharashtra government. The demand has been revived once again and the state ATS has started to put together a fresh dossier on the organisation. Rajhans called the proposal to ban the organisation unfair and said that such demands are politically motivated. He blamed the “Left-leaning intellectuals and the Congress for instigating the police establishment” against the organisation. “Left intellectuals have been furthering their political dreams by pushing for banning of Hindu outfits in the State. We are being targeted,” Rajhans claimed. 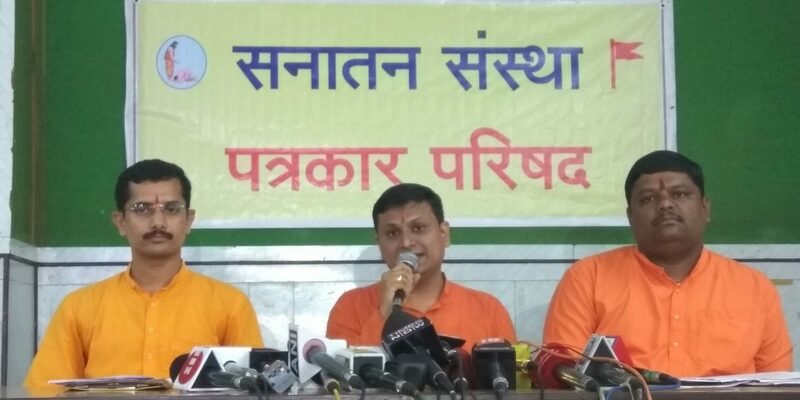 On August 10, the ATS arrested three members of this module – Vaibhav Raut, 40, an alleged member of the Hindu Govansh Raksha Samiti and an alleged sympathiser of the Sanstha; 39-year old Sudhanva Gondhalekar from Satara and a member of the Shri Shivpratishthan Hindustan – an organisation run by Hindutva leader Manohar alias Sambhaji Bhide; and 25- year old Sharad Kalaskar, a follower of HJS. The ATS also went on to arrest former Shiv Sena corporator Shrikant Pangarkar and another alleged member of Shri Shivpratishthan Hindustan, Avinash Pawar. Kalaskar’s interrogation led the ATS sleuths to Sachin Andure, a resident of Aurangabad in Maharashtra and the ATS claims the two were involved in Dabholkar’s shoot out. Andure is allegedly a member of the HJS. The ATS claims to have seized a vast quantity of explosives from Raut’s residence in Nallasopara outside Mumbai on August 10. While Raut has not been directly named in the murder case so far, he was a regular face at the conference organised by the Sanstha and is believed to have provided logistic support to the organisation. He, the ATS claims, was a part of the larger terror network that the HJS and the Sanstha has allegedly been a part of. The CBI, which is investigating Dabholkar’s murder, on Sunday told the special CBI court in Pune that the arms used in Dabholkar and Lankesh’s murder were the same. This was the first time that the central agency said there was a direct link in the two murders. This claim was made at the time of seeking Andhure’s custody. The Karnataka ATS also claims that Gondhalekar has been long associated with HJS and his role have been probed in Lankesh’s murder case and that that Pangarkar too is associated with HJS. The Sanstha spokespersons have maintained that the organisation is only involved in “religious activities” and has no role to play in any murder or terror activities. Towards the end of the press conference, as the reporters began to bombard Rajhans and Ghanvat with facts and the inflammatory content published in the organisation’s mouthpiece Sanathan Prabhat, the two dodged most questions.